Editor: My parents bought their first house in Ashburn back in the early 1990s for the great schools, scenery, and sense of community. 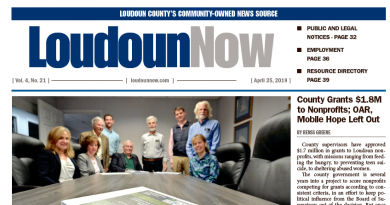 That sense of community evidently lives on and is stronger than ever, which is apparent based on the hundreds of upset families and homeowners packed in the Broad Run auditorium at the May 30 Farmwell Road widening meeting. Unfortunately, the scenery and protection from the hustling and bustling Farmwell Road may not exist for much longer. Instead of running through a laundry list of complaints that I’m sure most Ashburn residents have heard multiple times in a multitude of different ways, I would like to offer a few suggestions regarding the improvement of transportation throughout Ashburn without constructing a roaring superhighway through Ashburn neighborhoods. First, regarding the Smith Switch Road intersection, it has been apparent that an extensive amount of traffic during the evening hours attempts to turn left from Waxpool Road, causing spillover backups on the through westbound lanes. This in turn causes adverse traffic conditions for Ashburn residents wishing to continue straight onto Farmwell Road. I suggest an additional left turn lane. East of Smith Switch Road, Waxpool Road is three lanes. The two right lanes can be used as through lanes to continue westbound onto Farmwell Road, and the left through lane can split into two left turn lanes at the intersection for those wishing to turn left onto Waxpool Road. From all points west of this intersection, Farmwell Road should remain no more than two lanes in each direction. As many Ashburn residents may know, going southbound on Ashburn Village Boulevard crossing Farmwell Road can be quite a hassle because there is only one through lane. It would be advantageous to both construct an additional straight lane and extend the right turn lane for those wishing to turn onto westbound Farmwell Road. Additional left turn lanes from both directions of Farmwell Road would allow traffic light cycles to be shortened. Additionally, to solve the problem of pedestrian access, signalized crosswalks should be added at Farmwell Road and Hemingway Drive. There is a small dirt path connecting The Fields Apartments and Cedar Lake in Ashburn Village, connecting to Cheltenham Circle and Felicity Place. However, there is neither a safe crossing at Hemingway Drive nor a sidewalk to connect to a safe crossing at Ashburn Road. Additional through lanes do not significantly relieve the adverse traffic conditions, but combatting areas of spillover traffic and bottlenecks would drastically reduce congestion. Notice spillover traffic is being solved on Rt. 7 and other local roads by improving intersections, not adding supplemental through lanes. This compromise allows Ashburn residents to not fear a superhighway dissecting their community, but permits traffic conditions to improve for all motorists in the area and does not compromise the safety of Ashburn children. Lastly, I would like to thank Supervisor Ron Meyer for his drive and passion for doing what is morally right: serving his constituents. It is disheartening that some county officials, both elected and unelected, aren’t putting the interests of the people they serve first. I sure know that none of them would want a monstrous superhighway in their backyard or the safety of their children to be compromised.